Chrysler Airflow car books includes the advertising history of of the Airflow in DVD plus several manuals. The Chrysler Airflow was an automobile produced by the Chrysler Corporation from 1934 to 1937. 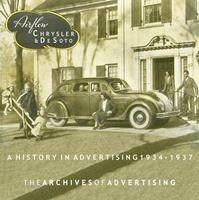 Airflow Chrysler & DeSoto: A History In Advertising 1934-37 by William McBride CD ROM (2001) follows the careers of the Airflow and DeSoto in the company's own magazine and newspaper advertising. The cars were an engineering success and a marketing failure. This CD-ROM contains a browsable collection of ads carefully scanned from original magazines and newspapers. The ads are searchable by year and model of product and can be viewed on any computer.